Effects of green tea extract on learning, memory, behavior and acetylcholinesterase activity in young and old male rats. Kaur T, Pathak CM, Pandhi P, Khanduja KL. Department of Biophysics, Post Graduate Institute of Medical Education and Research, Chandigarh, India. OBJECTIVE: To study the effects of green tea extract administration on age-related cognition in young and old male Wistar rats. METHODS: Young and old rats were orally administered 0.5% green tea extract for a period of eight weeks and were evaluated by passive avoidance, elevated maze plus paradigm and changes in acetylcholinesterase activity. RESULTS: Treatment of young and old rats with the extract resulted in no significant difference in performance on the rota rod treadmill test/righting reflex time. Green tea extract significantly improved learning and memory in older rats, with increased retention latency to enter difference in passive avoidance test. In the elevated maze test, green tea treatment resulted in significantly more number of entries in the enclosed arm by the young and old rats. Decline in acetylcholinesterase activity was observed in the cerebrum of green tea treated old rats in comparison to the green tea treated young rats. CONCLUSION: Green tea extract administration is effective in enhancing learning and memory in aged rats, and hence, may serve useful in reversing age-related deficits. Prevention of hypertension, cardiovascular damage and endothelial dysfunction with green tea extracts. Antonello M, Montemurro D, Bolognesi M, Di Pascoli M, Piva A, Grego F, Sticchi D, Giuliani L, Garbisa S, Rossi GP. Department of Vascular Surgery, University of Padova, Padova, Italy. Am J Hypertens. 2007 Dec;20(12):1321-8. BACKGROUND: We investigated the effect of green tea extract (GTE) in arterial hypertension with high oxidative stress. Angiotensin (Ang) II induces endothelial dysfunction (ED) that is crucial for the development of atherosclerosis and hypertension. METHODS: Male Sprague-Dawley rats, 13 weeks old, randomly assigned to drinking water with or without GTE (6 mg/mL) received a vehicle, a high (700 mug/kg/d) or a low (350 mug/kg/d) Ang II dose for 13 days, by osmotic mini-pumps. Blood pressure (BP) was measured with telemetry. After sacrifice, left ventricular (LV) mass index, small mesenteric artery media-to-lumen ratio, and concentration-response curves of phenylephrine-precontracted arteries to acetylcholine were evaluated. The effect of the superoxide dismutase (SOD-1) analog tempol on artery responses to acetylcholine was assessed. Oxidative stress was measured by plasma hydroperoxides and nitrotyrosine levels. The mRNA of heme oxygenase 1 (HO-1), NADPH oxidase endothelial p22(phox) subunit, and SOD-1 was also measured in the aorta. RESULTS: Compared with vehicle high Ang II increased BP, LV mass index, media-to-lumen ratio, and hydroperoxide radicals. The GTE blunted these increases, prevented the increase in HO-1, p22(phox), and SOD-1 mRNA in aorta caused by Ang II, and reduced them below baseline levels. Low Ang II dose increased BP values and plasma hydroperoxides only during the first week. Both Ang II doses shifted rightward the curves to acetylcholine; this was prevented in vivo by GTE and abolished in vitro by tempol. CONCLUSIONS: The GTE prevented hypertension and target organ damage induced by a high Ang II dose, likely by prevention or scavenging of superoxide anion generation. Repletion of antioxidant status by EGCG and retardation of oxidative damage induced macromolecular anomalies in aged rats. Senthil Kumaran V, Arulmathi K, Srividhya R, Kalaiselvi P.
Department of Medical Biochemistry, DR.ALM Postgraduate Institute of Basic Medical Sciences, University of Madras, Taramani Campus, Chennai 600 113, India. Ageing is defined as the loss of ability to maintain cellular homeostasis of an organism associated with the free radical-elicited oxidative damage to cellular macromolecules. The aim of this study was to evaluate the efficacy of epigallocatechin-3-gallate (EGCG), the key component of green tea catechins on attenuating the age associated oxidative perturbances by assessing the redox status in mitotic (liver) and post-mitotic (skeletal muscle) tissues of young and aged rats. From the results, we observed an increase in the marker for oxidative damage such as lipid peroxidation and protein carbonyl content in aged rats, when compared to young rats. This was accompanied with decreased levels of both enzymic and non-enzymic antioxidants and redox index. On supplementation with EGCG (100mg/kg body weight by oral gavage for 30 days), the levels of lipid peroxidation and protein carbonyl content were significantly decreased in aged rats, possibly by enhancing the GSH redox status, and both enzymic and non-enzymic antioxidants status. In conclusion, this study supports the beneficial effect of EGCG in alleviating oxidative disturbances in ageing and retard the age associated derangements in both mitotic and post-mitotic tissues. Tea catechin consumption reduces circulating oxidized low-density lipoprotein. Inami S, Takano M, Yamamoto M, Murakami D, Tajika K, Yodogawa K, Yokoyama S, Ohno N, Ohba T, Sano J, Ibuki C, Seino Y, Mizuno K.
Department of Internal Medicine, Chiba-Hokusoh Hospital, Nippon Medical School. Int Heart J. 2007 Nov;48(6):725-32. It has been reported that green tea consumption reduces the risk of coronary artery disease and cardiac events. Catechin is a major constituent of Japanese green tea and an antioxidant. Lipids and oxidization of low-density lipoprotein cholesterol (LDL-C) play important roles in atherosclerosis. Therefore, we evaluated the effect of catechin intake on the lipid profile and plasma oxidized LDL. The study population consisted of 40 healthy adult volunteers (10 men, 30 women). 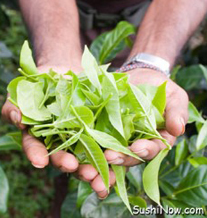 Catechin was extracted from green tea leaves. The subjects were randomly divided into two groups, a catechin group (n = 29) and a control group (n = 11). In the catechin group, catechin (500 mg: equivalent to 6 or 7 cups of green tea) was administered orally. Venous blood samples were obtained before eating a meal at the start and after 4 weeks without any lifestyle modification. Plasma oxidized LDL assay was performed with a sandwich-type enzyme immunoassay using anti-oxidized phosphatidylcholine monoclonal antibody. The baseline lipid profiles and tea consumptions were similar between the two groups. Plasma oxidized LDL was significantly decreased after catechin administration (from 9.56 +/- 9.2 to 7.76 +/- 7.7 U/mL, P = 0.005), while plasma LDL-C, triglyceride, and HDL-C concentrations did not change. Catechin decreased the plasma oxidized LDL concentration without significant change in plasma LDL concentration. The mechanism of the beneficial effects of green tea on coronary artery disease might result from a decrease in plasma oxidized LDL. Green tea catechin as a chemical chaperone in cancer prevention. Kuzuhara T, Suganuma M, Fujiki H.
Laboratory of Biochemistry, Faculty of Pharmaceutical Sciences, Tokushima Bunri University, Yamashiro-cho, Tokushima 770-8514, Japan. Green tea catechins have recently gained significant acceptance as a cancer preventive, and one of the important features of catechins is their interactions with various target molecules. We recently found a functional and structural similarity between catechins and chaperones: Stochastic conformational analysis in silico revealed numerous conformations of (-)-epigallocatechin gallate, (-)-epicatechin gallate and (-)-epigallocatechin, showing a unique flexibility and mobility of the catechin molecules and suggesting the significance of a galloyl group in conformational variation. Since these conformations result in interaction with various types of molecules, we think that green tea catechin induces cancer preventive activity mediated through a chaperone-like property. Effects of green tea on insulin sensitivity, lipid profile and expression of PPARalpha and PPARgamma and their target genes in obese dogs. Serisier S, Leray V, Poudroux W, Magot T, Ouguerram K, Nguyen P. Nutrition and Endocrinology Unit, National Veterinary School of Nantes, France. As in man, canine obesity is associated with insulin resistance, dyslipidaemia and other chronic diseases. This study was designed to examine the effects of a nutritional supplement (green tea) on insulin sensitivity and plasma lipid concentrations in an obese insulin-resistant dog model. We also determined mRNA expression of two transcription factors, PPARgamma and PPARalpha, and some of their target genes, including GLUT4, lipoprotein lipase (LPL) and adiponectin. Obese dogs were divided into two groups: a green tea group (n 6); a control group (n 4). Dogs in the green tea group were given green tea extract (80 mg/kg per d) orally, just before their single daily meal, for 12 weeks. Insulin sensitivity (using a euglycaemic-hyperinsulinaemic clamp) and concentrations of plasma TAG, total cholesterol and NEFA were assessed in each group. Gene expression was measured in visceral and subcutaneous adipose tissues and in liver and skeletal muscle, by real-time PCR. At 12 weeks in the green tea group, mean insulin sensitivity index was 60 (sem 11) % higher (P < 0.05) and TAG concentration 50 (sem 10) % lower (P < 0.001), than baseline. PPARgamma, GLUT4, LPL and adiponectin expression were significantly higher in both adipose tissues, whilst PPARalpha and LPL expression were significantly higher in skeletal muscle, compared with baseline. These findings show that nutritional doses of green tea extract may improve insulin sensitivity and lipid profile and alter the expression of genes involved in glucose and lipid homeostasis. 28-Day oral (gavage) toxicity studies of green tea catechins prepared for beverages in rats. Chengelis CP, Kirkpatrick JB, Regan KS, Radovsky AE, Beck MJ, Morita O, Tamaki Y, Suzuki H.
WIL Research Laboratories, LLC, 1407 George Road, Ashland, OH 44805-9281, United States. The beneficial health effects associated with drinking green tea are widely considered to be due primarily to tea catechins. Heat treatment of marketed green tea beverages for sterilization causes epimerization and/or polymerization of tea catechins. Safety studies on heat-treated tea catechins are limited. The objective of the present study was to evaluate potential adverse effects, if any, of two standardized green tea catechin (GTC) preparations: one that underwent heat sterilization (GTC-H) and one that was not heat-sterilized (GTC-UH). A decaffeinated preparation of the GTC-H (GTC-HDC) was also evaluated to ascertain if any effects were due to caffeine. The GTC preparations were administered to rats once daily at levels up to 2000mg/kg/day for 28 days. There were no deaths attributable to the GTC preparations. The clinical condition of the animals, functional observational battery, motor activity, clinical pathology evaluations, organ weights, and gross necropsy findings were unaffected by any of the GTC preparations. GTC-HDC or GTC-UH dosing had no effects on body weights or microscopic findings, whereas lower body weights and food consumption were observed in the 1000 and 2000mg/kg/day GTC-H group males. The no observed-adverse-effect level (NOAEL) for localized gastric effects for GTC-H was 1000mg/kg/day. No other target organs were identified. Thus, the NOAEL for systemic toxicity following oral administration was 2000mg/kg/day for GTC-H, GTC HDC, and GTC-UH under the conditions of this study. *The products and the claims made about specific products on or through this site have not been evaluated by JivaSupplements.com or the United States Food and Drug Administration and are not approved to diagnose, treat, cure or prevent disease. The information provided on this site is for informational purposes only and is not intended as a substitute for advice from your physician or other health care professional or any information contained on or in any product label or packaging. You should not use the information on this site for diagnosis or treatment of any health problem or for prescription of any medication or other treatment. You should consult with a health care professional before starting any diet, exercise or supplementation program, before taking any medication, or if you have or suspect you might have a health problem.